Labor Day weekend always feels like we're saying goodbye to summer, but the weather certainly seemed like mid-summer at the lake! The beautiful weekend included some fun beach time for Cameron. 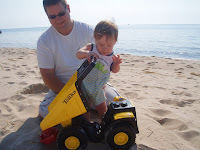 He finally had a chance to test out his big, huge Tonka truck in the sand! His cousins, Mike, Kevin and Eric gave him the colossal toy, which he can actually sit in. When Jane was much younger, she and all of her cousins played with Tonka trucks on the beach too. However, they were much sm aller and made with metal, complete with sharp edges. Tonka's definitely made some great improvements. Aunt Joyce had fun playing in the sand with Cam as well. He was showing her how tasty the sand was and how easy it is to rinse off your hands when you have a big bucket of water. Many thanks to "Auntie" Jo for giving Cam the big bucket full of beach toys for his birthday! Sunday included a special first birthday party for Cameron's buddy and Jane's godson, Will. Will's Mom, Joanne, made the most delicious homemade cupcakes with homemade frosting. Cam absolutely loved them, as did everyone. 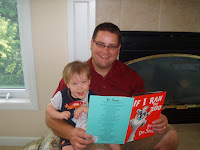 Cam and his Dad had some Dr. Suess time at Will's party. What day would be complete without some horsing around? "Rocket Booster" is another fun game that Cameron and Chris play. It is comprised of Cam's Dad boosting up in the air at any given moment. The element of surprise seems to be what he likes best. Hope everyone had a fun, relaxing holiday weekend!